Last night was the Kamloops Sports Hall of Fame Banquet. I had been nominated for “Female Athlete of the Year”. Quite an honour to be nominated when so new to this community. Never having been to a Sports Banquet before I had no idea it would be so well attended. I should have guessed though with this being the Tournament Capitol of Canada. Anyhow it was Friday and I still didn’t have a ticket for Keith…no problem I thought I’ll just call to order one. Well all 380 seats had been sold out, but I was on the waiting list. At 6:30 Friday night I got Keith a ticket for the following evening. It was a fun night with drinks at 6, dinner at 7, awards, speeches and slideshows. I steered clear of the wine until after Female of the Year was awarded on the off chance I would have to give a speech. The slideshow for my category began and I became increasingly more nervous. I had some pretty stiff competition, but the announcement came and I was up to accept my award. Female athlete of the Year. Wow, what an honour. I shook a little through my thanks, but I think made out okay. Henry Pejril, the man you have to thank for hosting many National championships and the 2006 BC Summer Games cycling events was very deservedly awarded “Sportsperson of the Year”. A good night for cycling. The evening’s guest speaker Kelly Smith did a fantastic job. Smith was an enthusiast of every extreme sport including mountain biking. A rock climbing accident changed the course of his life leaving him paralyzed from the waist down at a young age. Still an adrenaline junkie Smith threw some mtb tires on his chair, dived back in to white water kayaking and tried out the wheelchair race as part of the Vancouver Sun Run. Within 8 years Kelly had groomed himself into an olympic athlete in the Wheelchair Marathon Event. Through an inspiring slideshow he gave us insights into his Olympic preparation and what it was like to win Silver. It was a really inspiring evening and helped to refocus my goals and determination for the Season. Congratulations on winning Kamloops Female Athlete of the Year! 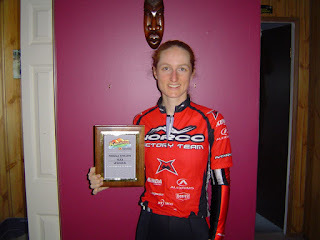 Thanks Jen, we'll have to get out for a ride next time your out for a visit! So PROUD of my FAV biker!!! Miss and Love you to pieces!! !